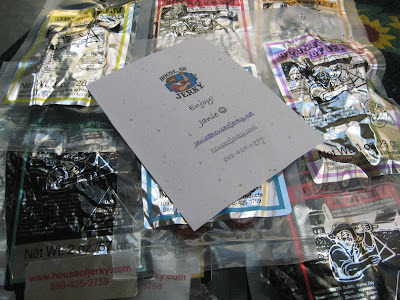 My son brought in the mail today, and he said we had a package from House of Jerky. Now, we love jerky around here, so I was pretty stoked. I opened up the box and was drooling, but I wanted to wait until this evening to actually try out the jerky. I'm a night person, and I save treats for later in the day. I did have to check out the jerky though, and there are just so many that they offer at House of Jerky. They have beef jerky which is what I'm most familiar with but also turkey, buffalo, and ostrich jerky. After spending the morning working and the afternoon shopping, I ripped into the black pepper beef jerky. This jerky is the real deal. I do buy grocery store jerky, and it is fine. But, some of my family members make homemade jerky, and it is just the BEST. It's like the difference between grocery cake and the ones you make at home. No comparison. 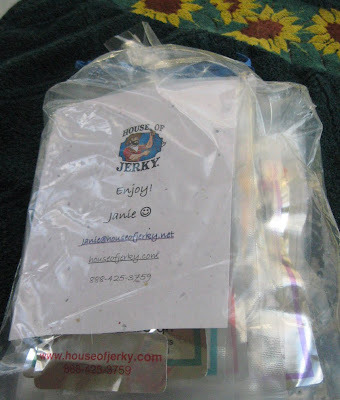 House of Jerky has that thicker cut and the flavor jolt that you get when you make it yourself. Honestly, if someone had just handed me a piece and not shown me the package, I would have sworn this jerky was made by a relative who knows how to rock the jerky. My son in college loves jerky and especially really great jerky, so I am going to mail him some or save him some. Maybe I better mail that jerky, or I might just accidentally eat it. His birthday is next week, so I think I will make him a care package with gifts and food. 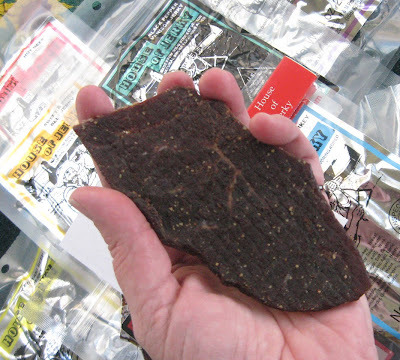 The black pepper beef jerky has a kick. It is not super hot, but it does have some heat. Of course, pepper is going to be hotter. So, if you like spicy foods, go for the pepper. If not, then get ones that do not have the pepper. Regardless, if you are a jerky fan or if you have never had real jerky, then check out House of Jerky. If you have had homemade jerky, you will find that this jerky is very much like that. If you have never had the real thing, then you are in for a real treat. Ostrich Jerky from the House of Jerky - Yum!